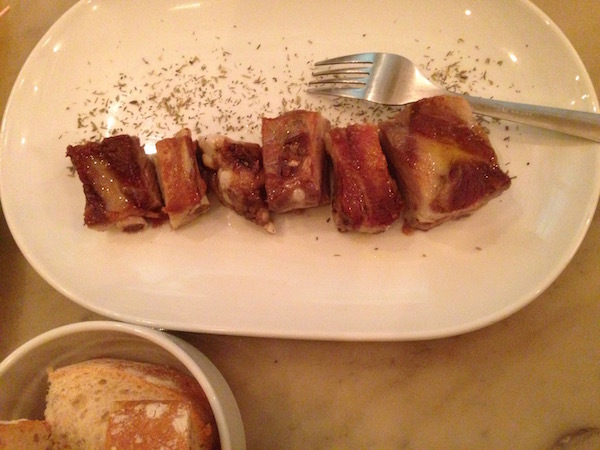 They also serve larger plates, such as Costella de porc confitada (pork ribs) and 200 gram (7 ounces) beef and chicken hamburgueses. I’ve tried the ribs, but I’ve not yet tried the hamburgers. And there are cargols (snails); galta de vedella amb salsa de Módena i miel (beef cheek with Modena and honey sauce); bacalla amb samfaina (cod with a red pepper, onion, aubergine, tomato and courgette/zucchini sauce — similar to ratatouille); cap i pota (stewed calf’s head and feet with tripe, chorizo and chickpeas) and many, many more tasty plates to choose from. 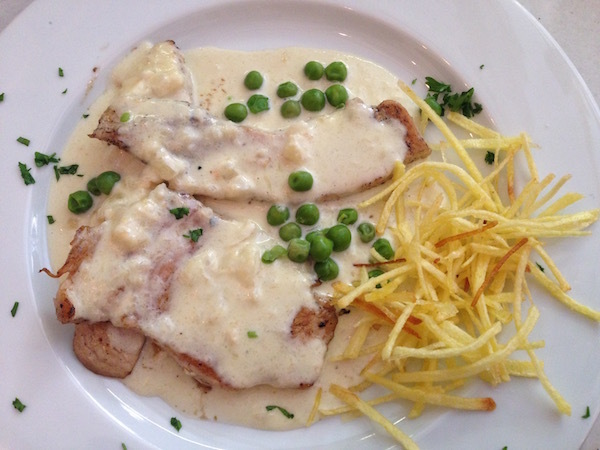 For me the only slight downside is the menú del día, offering two plates, a glass of wine or beer, dessert or coffee. It’s ok for 10,50€. 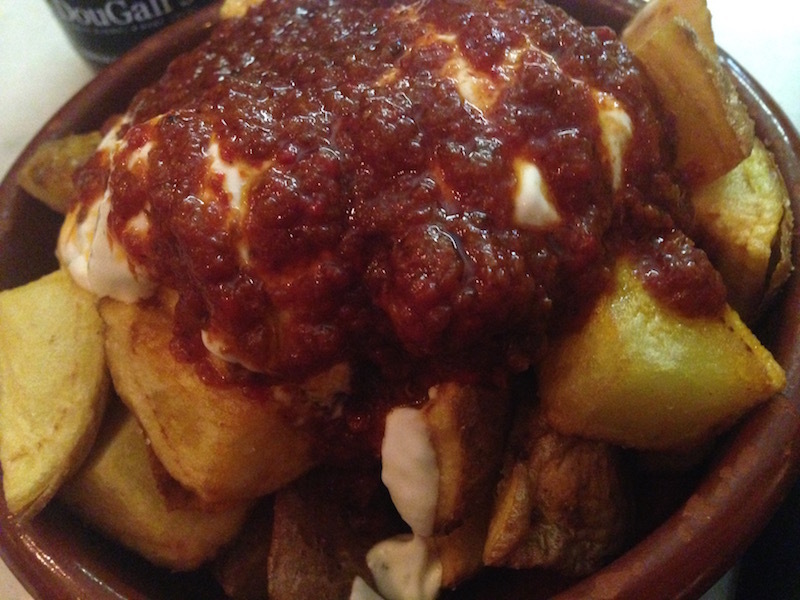 I’ve had three menús here and, though the food was very good, none of the meals left me satisfied as a good menú should. Maybe it’s the lack of heavy carbs — which is perfect if you have to go back to work after lunch. 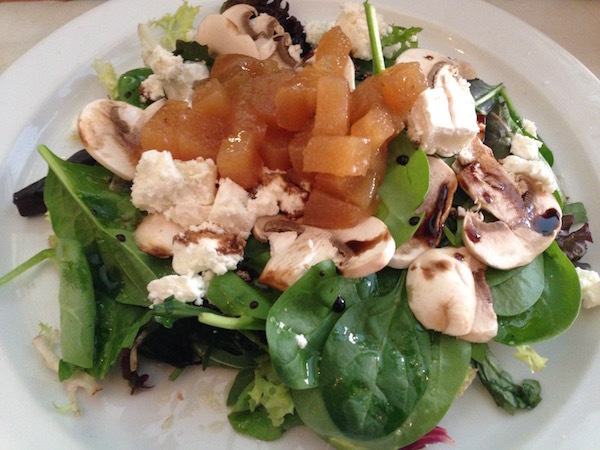 Goat cheese, mushroom and braised pear salad as served as a first plate as part of the menú del día. 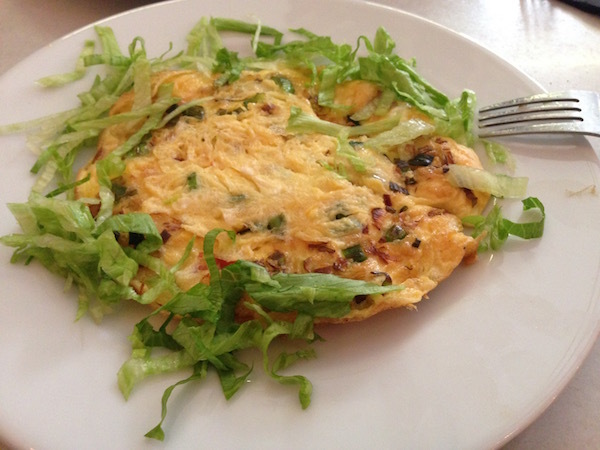 Omelette as served as a first course of the menú del día as served at Nou Can Codina. 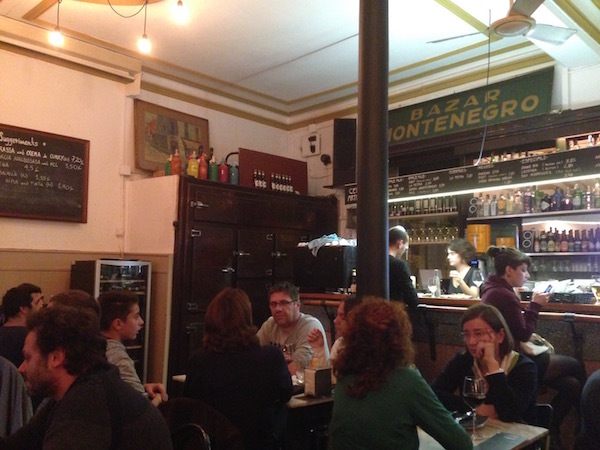 As well as Moritz beers on tap (Moritz 2€ and Moritz Epidor 2,10€) they offer a good spread of bottled craft beers such as La Petra, in both pale and dark versions, Hoptimista and Siren beers. Their house vermut is good for the price (1,60€) and their range of good wines are fairly priced. However, the servings of wine could be more generous — it sometimes seems they are squeezing 6 pourings from a bottle instead of the standard 5. For a while after they opened the service was a bit hit and miss. It was never bad — just a bit bumpy, and not always as good as it could have been. They seem now to have settled into a more efficient team and you won’t have to wait that long to get croquettas, beers and wine all assembled. Friendly and helpful servers. Some English can be spoken. Overall, it’s very relaxed. During the day it has the feel of a cool coffee-bar; a good spot for reading the daily paper. Then there’s lunchtime, and it’s never too rushed. Late afternoon the place kind of morphs into a cross between bodega and coffee bar, and in the evenings it becomes a hybrid of bistro-tapas bar/wine-bar and local pub. Never too loud, even during FC Barcelona matches which they project onto a very large screen. Never so crammed as to be uncomfortable. Never too empty to be a lonely place. 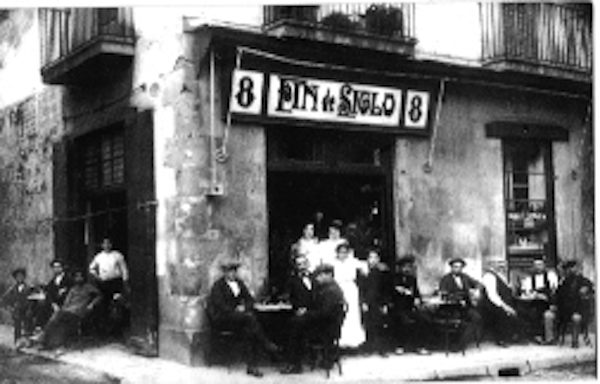 Well, two of you could spend an hour of your time here munching on eight croquettas and morcilla, and having 2 beers each, and still see change from 20€. Over the past few years I have spent quite a bit of time and money here and, given the undeniable quality of the bites on offer, and the reasonable prices for beers and wines, I think it offers outstanding value. I wholeheartedly recommend a visit here if you find yourself in the barrio. Go on… give it a crack — you’ll be pleasantly surprised. On the corner of Torrent de l’Olla and Carrer Perill, just one street up from Carrer Còrsega at the bottom end of Gràcia, a five-minute stroll from Cinc d’Oro (the junction of Passeig de Gràcia and Avenida Diagonal). Monday to Thursday: 9am ’til 11pm. Sunday: 12 noon ’til 5pm. Spotted by Locals write up HERE. 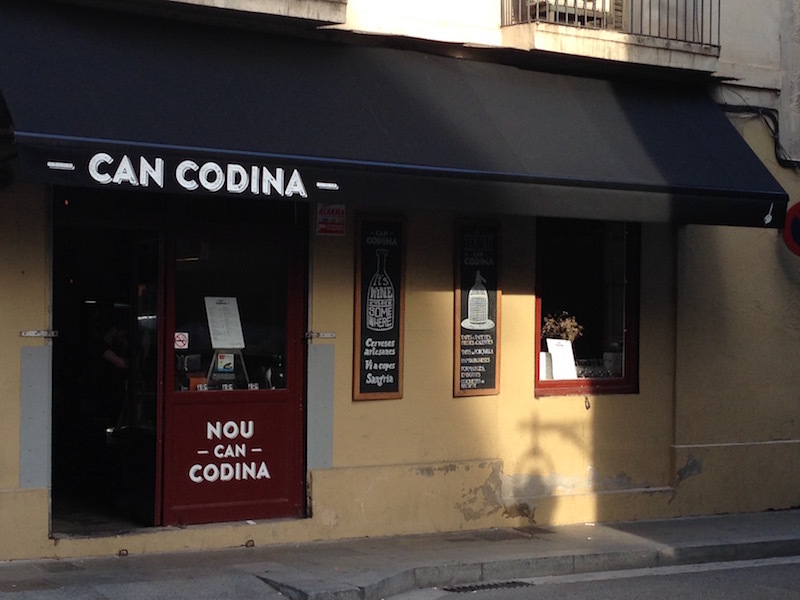 Nou Can Codina does not have a website but you will find them on Facebook.